Certificate will be provided to candidates who score more than 80% in the exam. Total of 2 attempts are allowed in this exam, and the best score would be considered. For FAQs, refer description below. 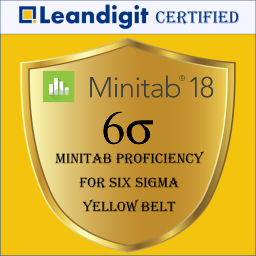 Who is Mintab Proficiency for Six Sigma Yellow Belt Exam for? This certificate exam is for you, if anyone new to statistical problem solving, and want to use Minitab as a part of their Six Sigma journey. By taking this exam, you will gain necessary confidence to use Minitab in your Lean Six Sigma journey. Why do I need Minitab for Six Sigma? Statistics is an essential component of Six Sigma. Minitab is one of the most intuitive and easy to use statistical package, and it makes learning and applying statistics fun and intuitive. Moreover, most improvement focused organizations consider Minitab skill as essential for roles in quality and improvement related roles. Certificate will be provided to candidates who score more than 80% in the exam. Two exam attempts are allowed per enrollment. The best of the two exam scores will be considered for qualifying criteria. How should I prepare for this exam? We recommend you to go through the contents/exercises/tutorials included in the pre-exam guide. This is visible once you log-in to the course. You will need Minitab 18 software, for the exam, so make sure you have an active Minitab software running on your computer. However, if you feel you are proficiency in Minitab, and are just looking for a certificate to test or prove your proficiency, you are welcome to directly attempt the exam. Is there any course pre-requisite for this exam? There are no course prerequisite for this certificate exam. All you need is some basic familiarity with Minitab 18 software, understanding of basic statistics, and follow through the content included in the pre-exam guide.